Don’t Miss Out on Black Friday Deals at Now Resorts & Spas! It’s the biggest shopping day of the year and we are excited to share that Now® Resorts & Spas is here to make your holiday vacation dreams come true! For 72-hours only, we are serving up great vacation deals starting as low as $168 for our fans during our Black Friday Sale! These special rates will have you escaping to Now Amber and Now Sapphire for incredible prices! Keep reading for the inside scoop! Don’t wait! Take advantage of this special sale for your next Now Resorts & Spas getaway! It’s the biggest shopping day of the year and we are excited to share that Now® Resorts & Spas is getting in on the action! These special rates will have you escaping to Now Onyx Punta Cana and Now Garden Punta Cana for a great price! Don’t wait – take advantage of our Black Friday Sale going on now at Now Resorts & Spas! Don’t Miss Black Friday Vacation Savings! Give the perfect gift of a tropical vacation this holiday season with our hot, exclusive Black Friday deals! With our 72-Hour Black Friday Sale, you will enjoy a luxury vacation at Now Sapphire Riviera Cancun starting at just $188 per person, per night! Don’t miss this incredible sale! Book your stay at Now Sapphire Riviera Cancun! But you’ll need to hurry to take advantage of these huge savings, because they’ll only be available for 72 hours! Book your getaway now for travel between January 3, 2015, and April 10, 2015! Keep unwraping Unlimited-Luxury® – Cyber Monday Sale is extended until November, 30! Your search for the perfect gift is over. But hurry, this offer only runs for the weekend!We’re offering exclusive savings at Now Amber Puerto Vallarta when you book between now and November 30th. 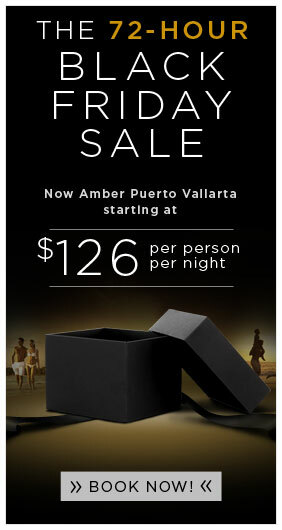 Experience an adventurous Now Amber starting at just $126 per person per night when you travel from January 2 to April 30, 2013! Book your Unlimited-Luxury® vacation now.